The jacket holds his arms in an unnatural position and behaving as if insane, he writhes and rolls about to free himself. Fear courses through his body. The wind blows him in dizzying circles high above the ground and he looks out onto a world that has literally been turned upside down. 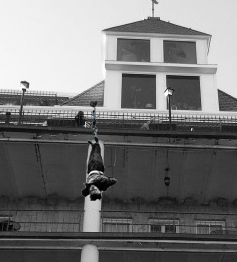 Escaping from a straitjacket while suspended in air is a performance made famous by Harry Houdini. See Houdini’s suspended straitjacket escape and the famous milk can escape performed live by Illusionist Sean-Paul of Intrigue Theater in Eureka Springs in October. Join Sean-Paul and medium Juliane Fay for a seance in America’s Most Haunted Hotel on Halloween night and attempt to communicate with the Great Houdini from beyond the grave. Sean-Paul will perform the Suspended Straitjacket Escape on October 4th at noon at the Crescent Hotel in Eureka Springs. The Citizen Newspaper has obtained a regulation straitjacket and has formally challenged Sean Paul to perform the escape that Houdini made famous. Buckled into the straitjacket, Sean-Paul will be hoisted 50 feet in the air and hung upside down. Ironically, Sean Paul will be hanging from the overlook of the Crescent Hotel and from the same spot where Michael, a mason working on the construction of the Crescent Hotel in the 1800’s, fell to his death. Documented paranormal activity has been captured in the hotel on many occasions earning it the title of America’s Most Haunted Hotel. Watch as Sean Paul attempts this insane escape in Eureka Springs on Saturday, October 4, 2012 at noon from the Crescent Hotel. This event is free and open to the public. The milk can escape will be performed by Sean-Paul of Intrigue Theater on October 20 at 7pm in Basin Spring Park. How long can you hold your breath? On Saturday, October 20th, Sean Paul will step handcuffed into an oversized 30 gallon milk container filled with water. The milk can will then be secured with four padlocks. 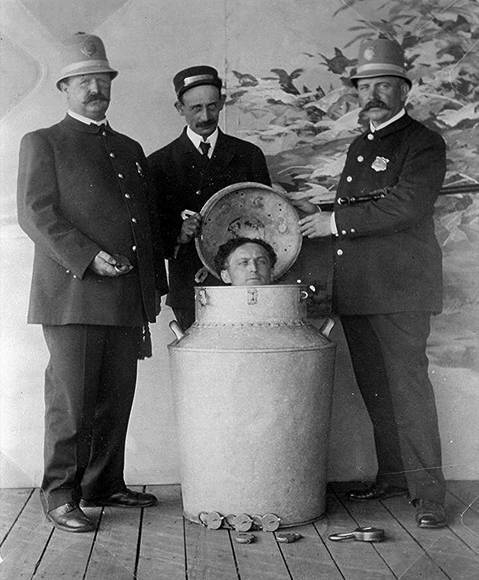 Houdini first performed the Milk Can escape in 1901 earning him notoriety as a master escape artist. See Sean Paul escape ‘a drowning death’ on October 20 in Basin Spring Park at 7pm. This event is free and open to the public. Houdini was fascinated with spiritualism and before his death, he promised his wife Bess that he would communicate with her if he were able. 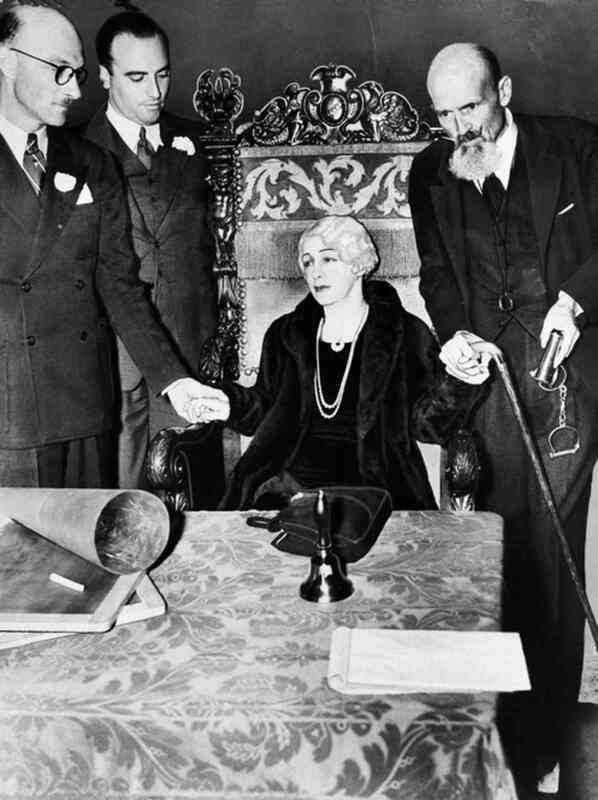 Following Houdini’s death in 1926 on Halloween, Bess held yearly séances on same date for ten years. This year on October 31st, Sean-Paul and Juliane Fay of Intrigue Theater will hold a séance and attempt to contact Houdini’s spirit. “While there have been perhaps hundreds of Houdini séances in the past 86 years – we don’t know of one ever conducted in a place as haunted as the Crescent Hotel,” says Juliane. Join Sean-Paul and Juliane for The Best of Intrigue Theater followed by a Houdini Séance beginning at 10pm in America’s Most Haunted Hotel on Halloween night. Get your tickets now! On Halloween, the anniversary of Houdini’s death, Intrigue Theater will hold a seance in America’s Most Haunted Hotel. Reserve your tickets today! In October, Sean-Paul will struggle to escape a fatal fall or drowning death but Intrigue Theater will turn YOUR world upside down. Explore the mysteries of the mind and the intrigue of the Victorian era with a Nationally-Acclaimed Illusionist and a Clairaudient Medium. Films like “The Illusionist” or “The Prestige” have captured the attentions of millions at the box office but you can experience it LIVE in the authentic Victorian town of Eureka Springs, Arkansas. Shows are Thursday-Saturdays at 8pm in the historic Gavioli Theater. Learn more about the 2012 Halloween show. Purchase your tickets online now! Watch a video about the Halloween engagements. This entry was posted on September 18, 2012 by estcblog in Attractions, Basin Park Hotel, Crescent Hotel, Ghosts, History, Things to Do and tagged America's Most Haunted Hotel, downtown, Eureka Springs, ghosts, historic downtown, historic hotels, history.